Using cosmetic dentistry to create a natural, long lasting smile which is in harmony with your oral and facial features. We have over 40 years of combined experience in the field of cosmetic and restorative dentistry, with different specialists and dentists we are able to provide comprehensive care for all your dental needs. Do you feel like you are unable to smile as widely as you possibly can or you try and avoid smiling completely in photographs because you are unhappy with your teeth? Here at BPI Dental, we are here to make sure that every patient we see leaves completely happy with our service and feel like they can walk into the world smiling once again. Here at BPI Dental, we use state of the art technologies to create your smile. We take a wax model of your teeth to give you a real idea of how your smile will look. With this model, it allows for you to inform us of any changes that you feel need to be made and our experienced team are on hand to make any necessary changes. Provide a strong and stable foundation for your replacement teeth, which look, feel and function just like the real things. They can replace missing teeth while preserving the condition of healthy adjacent teeth. Stimulate bone and gum tissue to provide an attractive and aesthetic smile over time. You can eat and speak with new confidence. 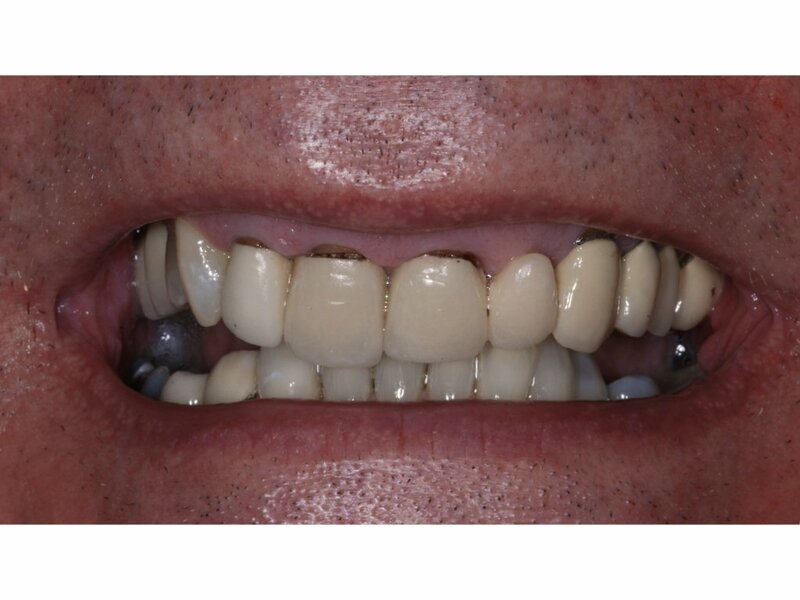 Before – This patient wished to improve the appearance of his smile. His existing crown and bridgework had been in place for the past 20 years. He particularly disliked the uneven edges of the teeth and the black gaps above each crown. After – The old crown and bridgework was removed and replaced with precision made crown and bridgework. He went through a course of teeth whitening to brighten his natural teeth. The result is a brighter whiter even smile without the unsightly black areas. 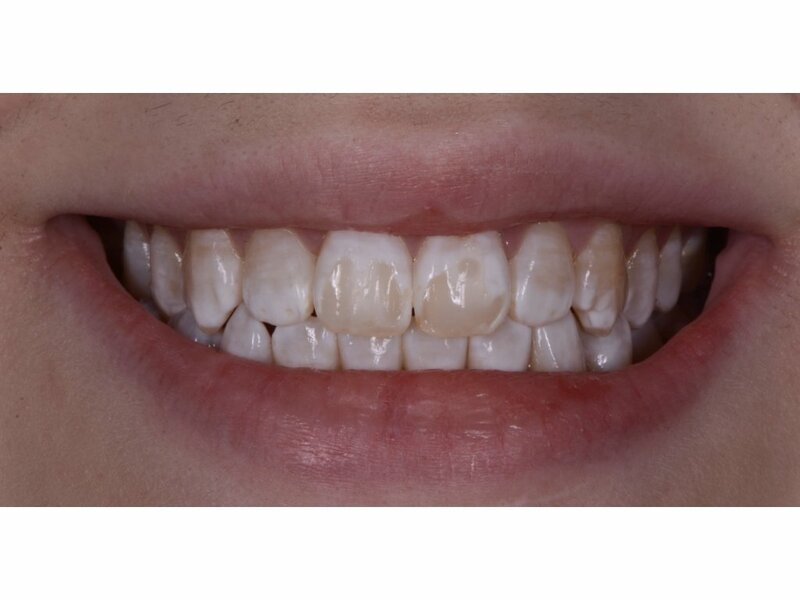 Before – This young patient wanted to improve the colour and uneven appearance of her smile. She was unhappy with the previous attempts at composite bonding, which had resulted in an oddly triangular shaped tooth. 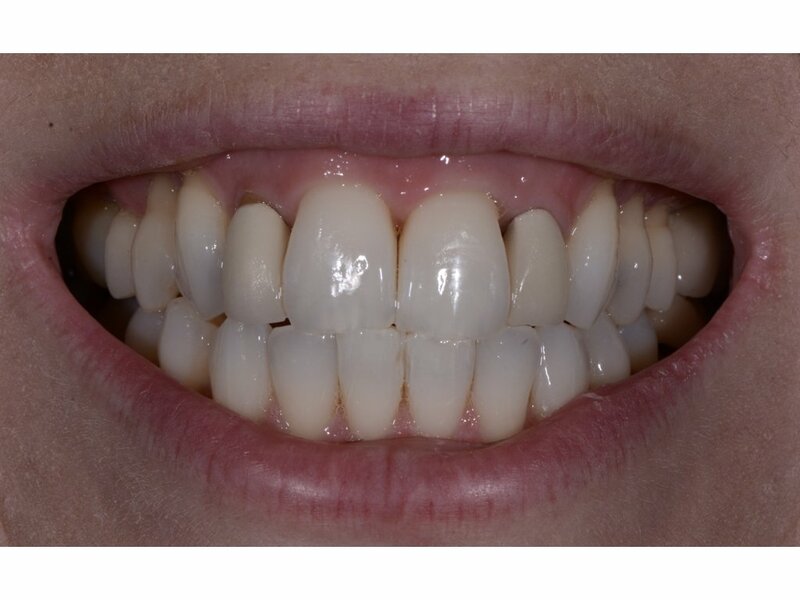 After – After some careful gum reshaping, teeth whitening and composite bonding, she was very happy with a brighter whiter smile. 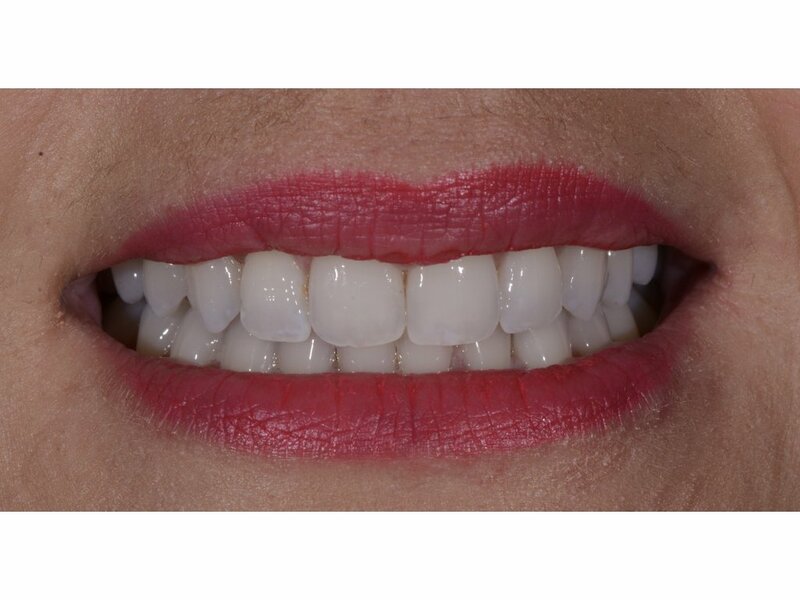 Before – This patient did not like the appearance of the dark lines around the edges of her metal based crowns. 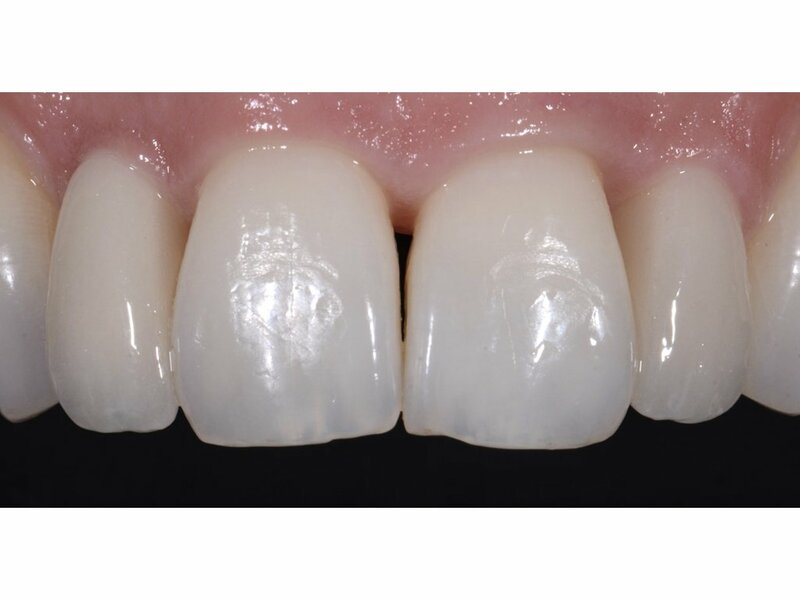 After – Following some teeth whitening, 2 all ceramic crowns were fitted, to eliminate the dark grey edges and restore harmony to the patient’s smile. 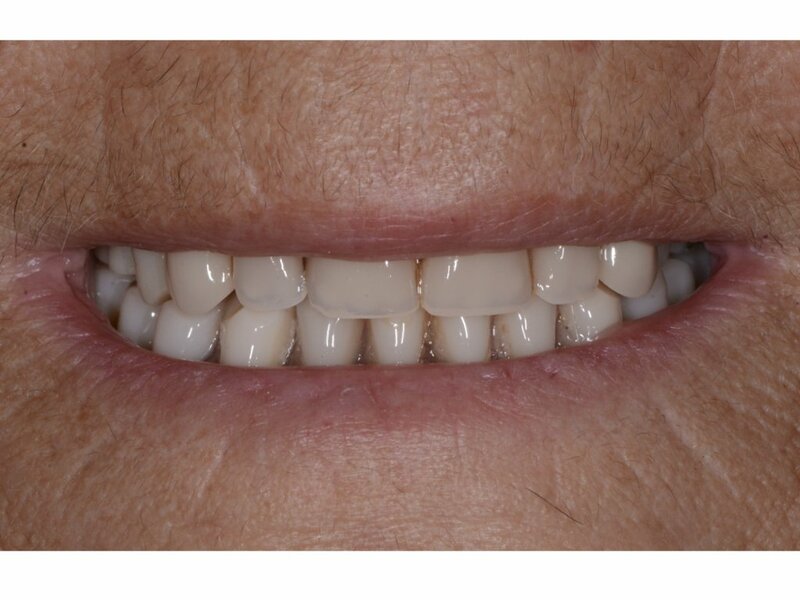 Before – This lovely patient presented with her worn existing denture, which she wished to be replaced. 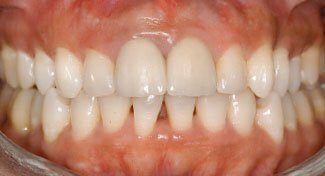 After – The teeth on the denture were designed with the input of the patient so we could create a smile that she was happy with. 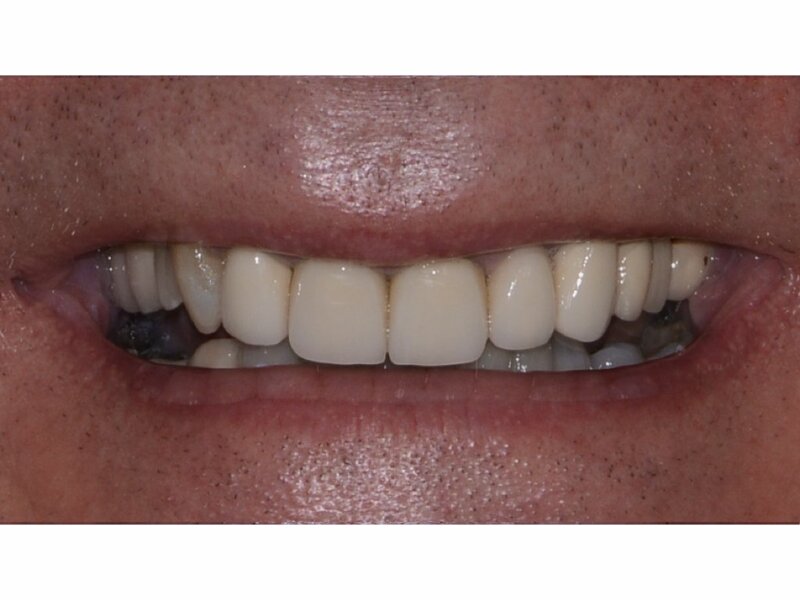 A natural looking smile was created on the denture stabilised by two dental implants. 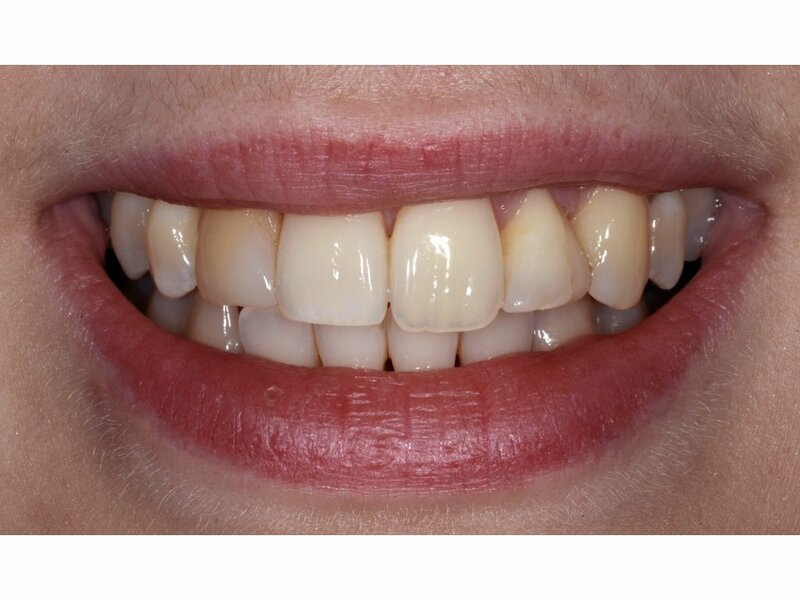 Before – This patient wished to improve the worn and chipped appearance of her teeth. Which had worsened over the years. 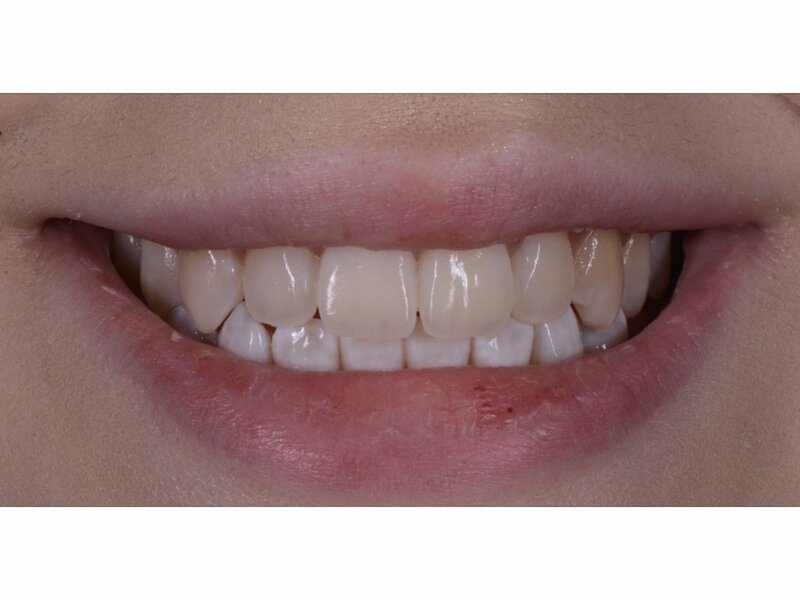 After – The teeth restored with composite bonding with no preparation and no injections, restoring her bite. 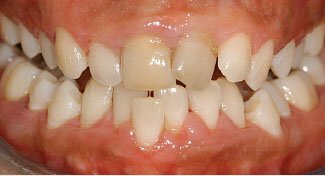 Before – This very young patient did not like the white patches on her teeth, previous attempts to improve this had failed and made matters worse. 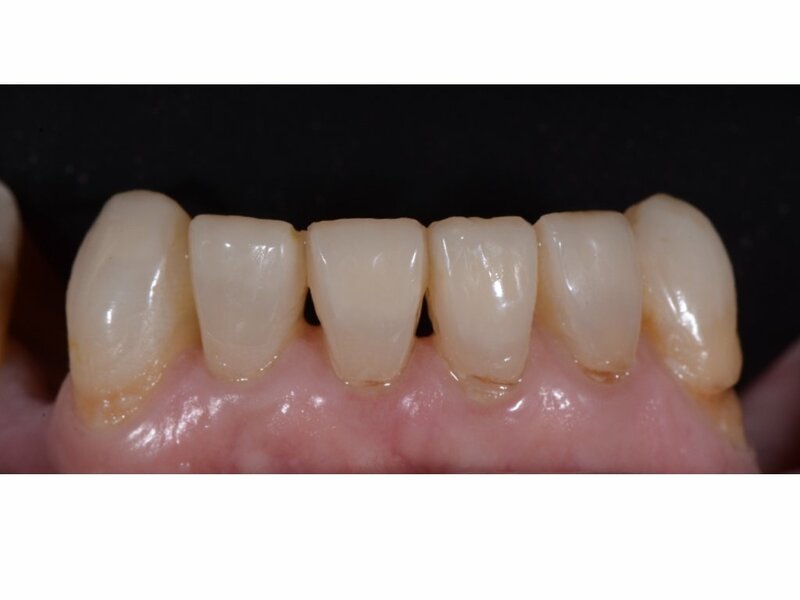 After – After removing the previous poorly matching fillings, the teeth were treated with new bonding. This eliminated the white patches and a harmonious youthful smile was recreated. 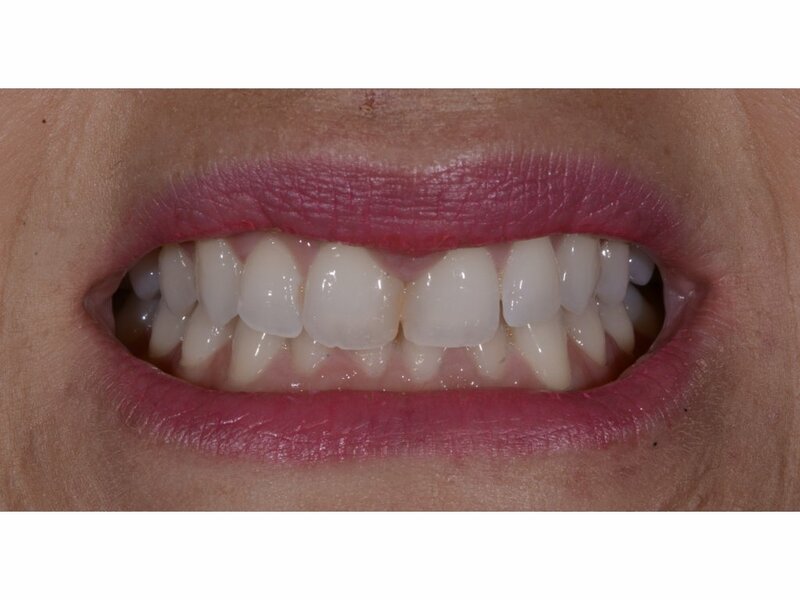 Before – This patient disliked the crowding of her upper teeth and the discoloured two filling on her front two teeth. 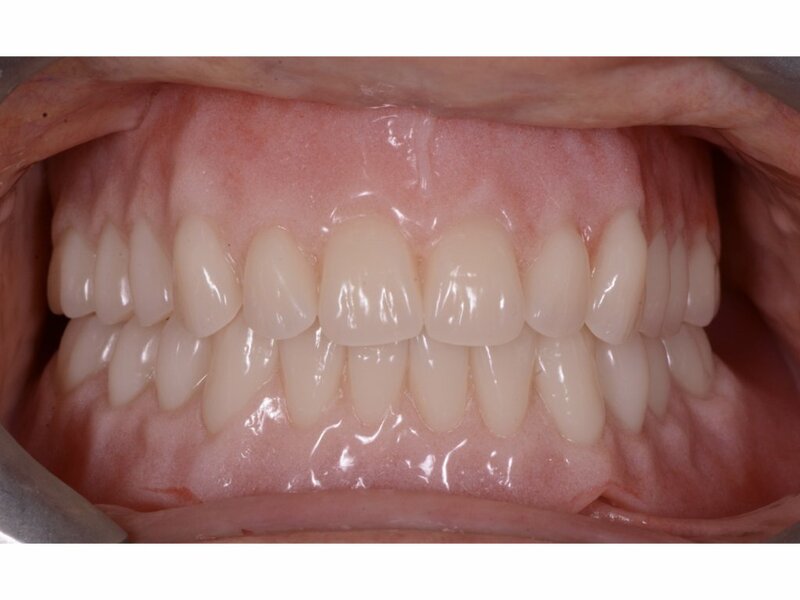 After – The previous fillings were removed without damaging her natural teeth, the teeth were straightened with a brace and finished off with some teeth whitening. All done in under 6 months. 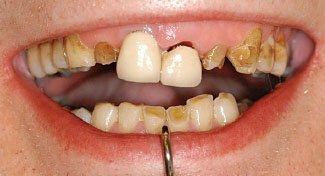 This young patient had undiagnosed severe gum problems and was unhappy with her crooked smile. Fortunately we were able to stabilise her severe gum disease following periodontal (gum) therapy. After orthodontic therapy to correct her crowded teeth, some gum repositioning was carried out to create an even gum line. 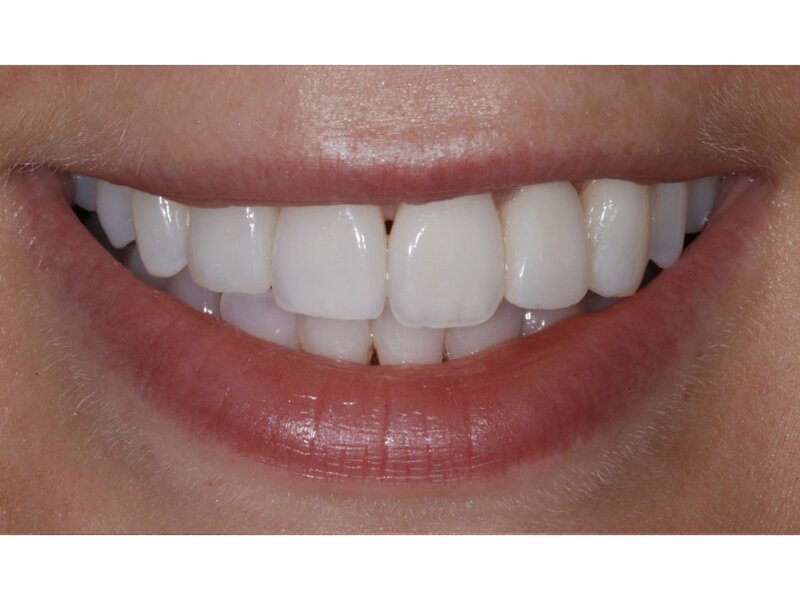 Finally after tooth whitening, two porcelain veneers were placed on her front teeth. The result is a long lasting smile which she is extremely happy with. Treatments: Periodontal Therapy, Orthodontics, Tooth Whitening and Veneers. This gentleman was very embarrassed with his smile and teeth. 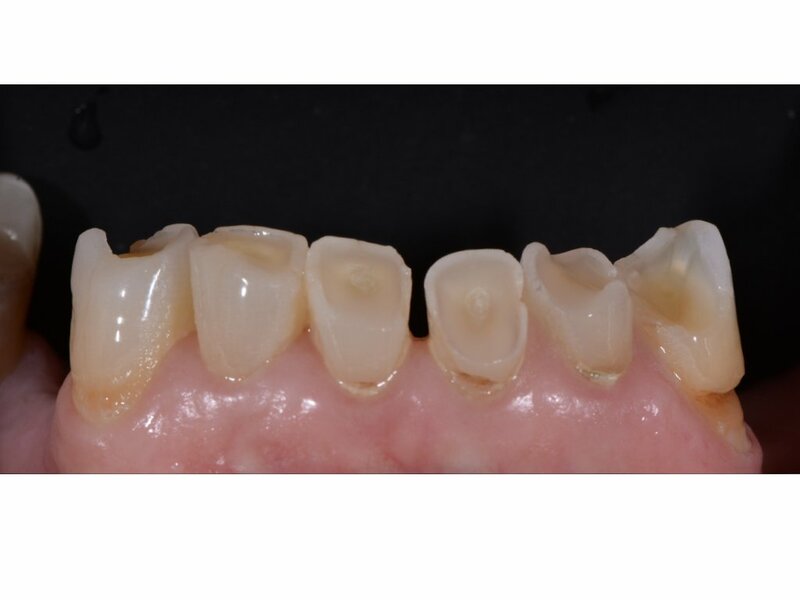 Uneven gum line along with mis-matching crowns contributed to his concerns. After having his piercing removed we embarked on a plan starting with periodontal therapy. 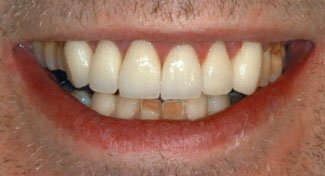 Following some gum recontouring on his upper teeth, all porcelain crowns were constructed which dramatically transformed his smile. His confidence has soared and he is much happier now. Treatments: Periodontal Therapy, Gum Recontouring and Porcelain Crowns. Our team are friendly, compassionate and will answer any questions you have. If you are unhappy with the appearance of your teeth, you shouldn’t feel like a great smile is out of your reach. 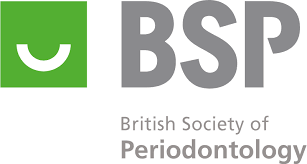 We have a number of options here at The Birmingham Periodontal and Implant Centre and we are here to make you comfortable with whatever treatment you may need. A Smile Makeover is made up of a number of treatments that all combine to leave you with that perfect and natural looking smile you have been craving for years. Our team here is made up of a number of experienced dentists that have seen hundreds of cases like yours and you can rest assured that you are in safe hands. We are here to ensure that we take into account your specific needs and work to create a smile that both you and we are happy with. Every one of our treatment plans are specific to the individual and we remain in close contact throughout the entire process to ensure that you and our team are happy with the procedure plan going forward. We consult with you before any big decisions are made and we will ensure that no stone is left unturned when it comes to you picking the ideal smile you want. We take a detailed examination of your mouth and take an impression of your teeth. This gives both the dentist and you, the patient an idea of how much treatment is required and we can then go on to discuss the options available to you. There are a number of factors that determine the treatment plan going forward. It very much depends on your personal preference and how much work you feel needs doing. We focus on providing implants, teeth whitening, braces, invisalign or restoring damaged teeth. The team here at BPI will ensure that you have a full consultation and are here to help with any issues you may have concerning your treatment.